The Haryanka dynasty is believed to have been the second ruling dynasty of Magadha, an empire of ancient India, which succeeded the mythological Barhadratha dynasty. The reign of this dynasty probably began in the middle of 6th century BCE. Initially, the capital was Rajagriha. Later, it was shifted to Pataliputra, near the present day Patna in India. Bhattiya founded the dynasty around 566 BCE, although Bimbisara, his grandson, significantly expanded the dynasty's boundaries during his rule from 544 BCE to 492 BCE. Thus Bimbisara is considered as the main founder of the dynasty. According to the Buddhist text, the Mahavamsa, Bimbisara was anointed king by his father, Bhattiya, at the age of fifteen. This dynasty was succeeded by the Shishunaga dynasty. The governance structure of Haryanka dynasty is mentioned in Buddhist texts. They mention gramakas (village headmen) who headed village assemblies and mahamatras (high-ranking officials) who had executive, judicial and military functions. Bimbisara reigned from 545-493 BCE. The extent of his kingdom is mentioned in Mahavagga. His advisors included Sona Kolivisa, Sumana (flower gatherer), Koliya (minister), Kumbhaghosaka (treasurer) and Jīvaka (physician). He was given the title of Seniya. Both Jain and Buddhist text claim the king to be a follower of their respective religions. Uttaradhyayana Sutra mention him to be a follower of Mahavira, whereas Sutta Nipata depict him and his wife, Khema, as a follower of Buddha. The latter further mentions him to have deputed Jīvaka to assist Buddha's Sangha. He also married Chellana and Kosala Devi, sister of Pasenadi. According to George Turnour and N.L. Dey, the name of the father of Bimbisara was Bhatiya or Bhattiya, but the Puranas refer him as Hemajit, Kshemajit, Kshetroja or Ksetrauja and the Tibetan texts mention him as Mahapadma. Ajatashatru reigned from 493-462 BCE. He married Vajira, Kosala's princess. In some sources, Bimbisara was imprisoned and killed by his son and successor, Ajatashatru, under whose rule the dynasty reached its largest extent. 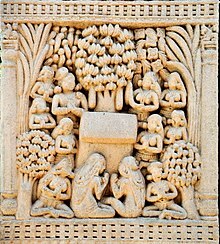 Ajatashatru was contemporary with Mahavira (599–527 BCE) and Gautama Buddha (563–483 BCE). Ajatashatru fought a war against Vajji, ruled by the Lichhavis, and conquered the republic of Vaisali. Udayin or Udayabhadra is mentioned in Buddhist and Jain texts as the successor of Ajatashatru. Puranas however mention him as the fourth king after Darshaka. Puranas mention Nandivardhana and Mahanandin as successors of Udayin. According to Buddhist tradition, Anurudhha, Munda and Nagadarshaka were his successors. Haryanka dynasty was ultimately overthrown out of power by their Amatya (minister), Shishunaga. ^ a b c d Upinder Singh 2016, p. 270. ^ Upinder Singh 2016, pp. 270-271. ^ a b Upinder Singh 2016, p. 271. ^ a b c Upinder Singh 2016, p. 273.